It seems that these days there is a surge of the "blame game." Someone, somewhere, somehow, some when, did something to you- as a child... as a teenager... as an adult. There's always someone to blame, and the best of the blames generally comes from the past. (I am not talking about severe trauma, or abuse; rather the ones that everyone has to deal with at some point in their lives.) That's the problem, by blaming we lose a part of our lives. I was struck that most people don't like to deal with how their parents, or their grandparents lived. My family were farmers. Nothing wrong with that, nothing at all. They lived in Transylvania, and had lived in a small village, and work, church and extended family were the foundation, if not the end all and be all of life. That was how they lived, and there was no margin for error, they worked for their food and they believed and held on to a religion. People were born as farmers, and worked as that, and should they want to be anything else, this was unacceptable. You were not an individual, but rather a part of a group trying to create food, and shelter and a living. That's what bound them together, it was a harder life, especially in a place such as Transylvania. There were characters in the villages and most people knew each other's business, and individuality wasn't encouraged. In fact, in many dresses or suits, almost all the siblings would wear the same outfit. Possibly not due to style, but due to the cost of materials for all of them. The women tended to marry young, and have numerous children, and the men would be the providers. Yet, now in the present, we are expected to be individuals, these strong people, full of empathy and compassions, with a higher sense of worth houses filled to the brim with stuff. We are not supposed to be as "down to earth" because we should have a sense of a style of our own, and go where the adventure lies, so that we live for the moment. Now, not everyone feels this way, but it does make one wonder what it takes to get back to ones roots. A good example is the art of crafts. With many people in Transylvania, there was a strong element of traditional dresses. Credit goes to the women who spend days and months creating these works of art. In a sense, the art and woodworking and craftwork bound the people closer together. 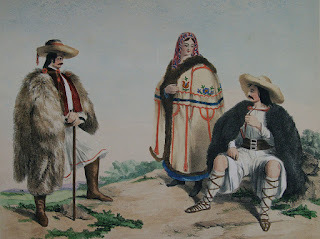 The Saxons had their own style of dresses, which were worn on important or special occasions, as did the Romanians, and the Hungarians and the Jewish communities. They all shared the common core value of community and hard work. They all felt their community had the most positive aspects, and that they were a part of the workings of the nation they lived in. After the Second World War, this all changed. 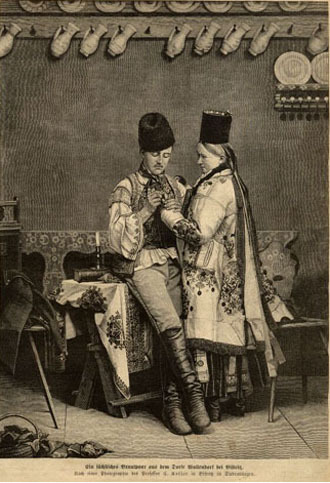 As many of these communities fled Transylvania, they attempted to keep the ties to the land they lived in, and in many cases loved. However, as the population who once lived in Transylvania passes, the ties that bind us to there, or those who do not live in Transylvania become loser. The ties are tested against a more Western culture, which values independence more than community. The farmers lost their land, and the descendants did not have the means to learn, especially when many would immigrate to the large cities in North America or other smaller European countries. As time has passed, we might blame them for not pushing towards a stronger community. We might blame them for holding us back or pushing too hard. However, in the process we create more loss instead of learning from the past and what the people of Transylvania accomplished with what they had at the time.